He was born in London thirty years ago, but when quite small the family moved to Australia, where all his boyhood recollections cluster. “I cannot remember so far back as the time when I was not drawing,” said Mr. Warren recently. “My first offences were houses with great volumes of smoke pouring from their allied chimneys. From this it was only a short step to drawing the school-masters, and then trouble began. One day when I had just finished an atrocious effigy of the teacher, he caught me red-handed, and I, ‘like a wretch o’ertaken in his tracks, with stolen chattels on his back,’ tremblingly awaited my punishment. On this occasion the master, evidently determined to make the punishment fit the crime, compelled me to make one hundred drawings of a certain face. Well, I can tell you that long before that task was finished all the artistic instinct in me seemed dead beyond hope of resurrection; but such was not the case, as a few weeks later I was again at my old pastime. At length the time came when the father wished his son to select a profession. It had been his hope and desire that Garnet should follow in his footsteps and become a physician, but this the boy was disinclined to do, lacking the necessary application. Finally deciding to become a dentist, he took service as an apprentice, but after five months the master declined to have the boy with him longer because of lack of interest and application. Next he became a stenographer in a business-office, remaining in that capacity for four years. After a time a tempting opportunity was offered Mr. Warren to go to South America on a business venture. He traveled along the whole Western coast and from thence up to San Francisco, California. [A passenger list at Ancestry.com said Warren arrived August 24, 1896 in San Francisco from Panama.] When in this bustling American metropolis of the Pacific, he applied for a position in the art department of the Examiner and was promptly assigned a place; but the well-filled department, with its numbers of young men working away like steam-engines under high pressure, frightened him so that before the morning came when he was to begin his work he had decided to return to Australia instead of remaining in the republic. Arriving home, he secured the position of cartoonist on The Queenslander, which he held for two years, when again his desire to travel and seek more promising fields overmastered him. Accordingly he set out for London, in which city he remained nine months, drawing some cartoons for the Chronicle, and several pictures for The King and other publications. London, however, seemed to promise less opportunity for advancement than America, so he set out for New York. [A passenger list said Warren arrived January 17, 1901 in New York from Liverpool.] That was about four years ago. He soon obtained a place on the New York Herald, though not as a cartoonist. He remained with the Herald for over two years, when he accepted an offer from the New York News, which position he retained until the reorganization of that paper. He then came to Boston and accepted a position offered on the Boston Herald. At the time of his coming to this city he determined to make cartoon-work his life occupation, and into his labors he has thrown much of that heart-interest which Longfellow tells us “giveth grace to every art.” His cartoons are widely copied, and though only thirty years of age he to-day ranks with our best American newspaper cartoonists. At the time of the profile, Warren was working for the New York Globe. In 1909 and 1910 Warren’s articles appeared nationally in newspapers such as the Los Angeles Herald, Ogden Standard and San Francisco Call. According to American Newspaper Comics (2012), Warren produced three series for the New York Evening Telegram: Mr. and Mrs. Garden Green (1907), The Holmes’ at Home (1907), and Mr. Exchange Ad (1908). For the New York Herald, Warren did Jack and Jill in Fairyland in 1910. The 1910 U.S. Federal Census recorded newspaper writer Warren and French wife, Regine, in Manhattan, New York City, at 145 East 32nd Street. They had been married eight years. 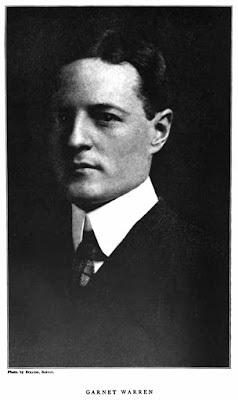 In 1911 Warren copyrighted numerous works. On June 10, 1914, Warren returned from a trip to Europe where he departed from Le Havre, France. His final destination was listed as Oradell, New Jersey. Warren was one of the experts in the April 1915 issue of Associated Advertising’s article, “Four Experts Talk Advertising Copy”. In the 1920 census, Warren and his wife were residents of Ridgewood, New Jersey. Warren had been naturalized and was an advertising writer. In 1926 Doubleday, Page & Company published The Romance of Design by Warren in collaboration with Horace B. Cheney. Warren has not yet been found in the 1930 census. A passenger list at Ancestry.com said Warren was in Europe from 1931 to 1933. He returned September 30, 1933, and his home address was 9 West 76th Street, New York, New York. Warren passed away May 27, 1937, in Hackensack, New Jersey, as reported by The New York Times on May 29. Garnet Warren, illustrator and writer, died yesterday afternoon of an intestinal disorder at Hackensack Hospital here. Mr. Warren, who was 64 years old, resided on East Saddle River Road, Upper Saddle River. Born in England, Mr. Warren received his education in Sydney, Australia, and returned to his birthplace as a youth. He drew cartoons for Punch and other publications before coming to this country in 1900. He was cartoonist and writer of special articles on the old New York Evening Telegram and New York Herald. In later years he was an advertising copy writer. At his death he was devoting himself to research for a historical novel. His widow, Mrs. Juliette Warren, survives. It’s not clear if Warren had remarried or the Times had the wrong name for his wife, Regine who, in the 1940 census, was a widow in Ramsey, New Jersey.